Hitachi, Ltd. today announced the achievement of rated output at the 40MW-class test facility with the new gas turbine, AHAT (Advanced Humid Air Turbine) system, being co-developed with the Central Research Institute of Electric Power Industry ("CRIEPI") and Sumitomo Precision Products Co., Ltd. ("SPP"). Through operations at this facility, it has been verified for the first time that the key components of the AHAT system can be applied to medium-class gas turbines. 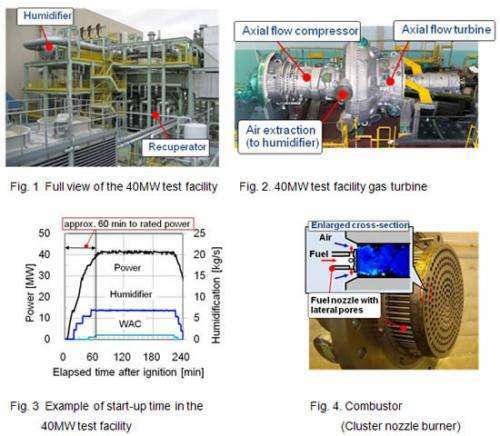 Further tests to confirm operating characteristics under various conditions and component reliability will be conducted while developing scale-up technology for application in a demonstration plant, to realize small-medium class (~ 200MW-class) highly efficient gas turbine generation systems. There is a growing demand in recent years for highly efficient gas turbines to achieve economic efficiency and low environmental impact. Further, increased efficiency in operating rate to improve stable operations, environmental consideration, and optimization of operating costs are being required of thermal power generation. Gas Turbine Combined Cycle ("GTCC") generation is used widely as a highly efficient power generation technology in gas thermal power generation but further development to increase efficiency and reduce costs is being anticipated. Also, as the mass introduction of renewable energy systems such as wind and solar is also taking place, a power adjustment system excelling in a fast start-up speed and load following capability, is becoming increasingly important. System configured for a medium-class gas turbine used in power utilities. In order to conduct Water Atomization Cooling ("WAC") in axial compressors for medium-class gas turbines, changes in the blade loadings and flow angles inside the compressor need to be considered. In relation to this issue, a droplet evaporation model was developed and incorporated in a fluid simulation, to optimize the compressor blade angles. Further, to address the increased thermal stress caused by the high humidity combustion gas, it is necessary to improve the cooling performance of the turbine component. In relation to this issue, a hybrid cooling nozzle was developed using the highly humid air and the discharged air from the compressor, enabling the nozzle to be cooled to below target temperature. When verification tests were conducted at the facility equipped with the above, a power generation efficiency equivalent to or better than an equivalent medium-class GTCC system was achieved based on calculations assuming equipment specifications for a commercial system. It was also confirmed that the start-up time from ignition to rated power could be achieved in a short period of approximately 60 minutes. This start-up time is approximately one-third that of a GTCC cold start (Hitachi performance: approximately 180 minutes). Contributing to a reduction in environmental load. In this 40MW-class test facility, stable combustion with reduced NOx emission under higher temperature and pressure conditions (Gas temperature 1,270℃, Pressure 1.7MPa) than the previous 3MW- class test facility (1,180℃, 0.8MPa) was required. In order to further reduce NOx, a fuel nozzle with lateral pores was developed to enhance mixing of fuel and air, optimizing it for a cluster nozzle burner which is a high humidity combustor. As a result, a NOx concentration of 24ppm (at 16％ O2) was confirmed for the humidity of the pilot equipment (approx. 10 weight％), and an outlook of achieving a NOx concentration of less than 10ppm for the humidity in commercial equipment (approx. 18 weight％) was achieved.